Monster puts a new spin on headphones with in-ear Turbines | What Hi-Fi? With styling derived from the 'Turbine' design of the company's phono plugs - an unlikely crossover, we agree - the new earphones were designed by 'Head Monster' Noel Lee, and are said to be the result of "three years of rigorous research, development, and refinement". At the heart of the design is an 8mm driver "precision-engineered for superb sonic detail that delivers the big sound, deep bass, and clarity that you'd expect from full size high-end speakers". 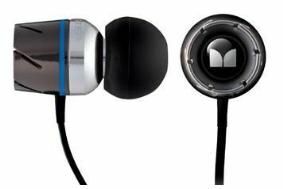 Other patented Monster technology used in the earphones is its Magnetic FluxTube for more accurate audio, and MicroStrand conductors for maximum flexibility and better signal transfer. Noel Lee says that "Life is too short to listen to bad headphones. Unfortunately, ordinary headphones simply can't reproduce the deep bass and rich highs of full-size speaker systems. "Monster is on a mission to make headphones sound better, and our new Turbine In-Ear Speakers allow people to hear truly remarkable sound from in-ear headphones. "The human ear can discern much more than any technical measuring device and the performance of Monster Turbines needs to be heard to be believed."